Unlike traditional media training, which teaches the simplistic tactic of constantly blowing your own horn, At Ease With the Media provides a wider range of skills. Spokespeople learn to manage exchanges with journalists to win-win outcomes—helping to generate clear, accurate stories on one side while advancing business objectives on the other. 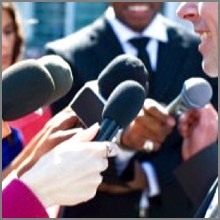 Spokespeople gain the skills to manage the twists and turns that inevitably occur during interviews. They learn to use interviews as a springboard to influence the attitudes, opinions and behaviour of specific audiences. Above all, At Ease With the Media helps manage risk. Spokespeople are taught to protect themselves and their organization at all times. They gain a series of proprietary defensive strategies, first of which is to learn when and how to stop talking as a primary skill. With print interviews specifically, less talking equals less context, and less risk of being quoted out of context. If you’re interested in taking your spokespeople to the next level, contact Eric. He’d love to apply his unique and effective media training program to the challenge of helping your spokespeople be At Ease With the Media. “I’ve had the privilege of working with Eric Bergman for many years. He is the best I've seen and has elevated media training to an entirely new level. “He custom tailors each session to his audience, learns your business and has led an international movement away from the flawed strategy of 'staying on message' that erodes credibility.